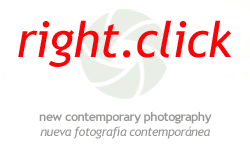 “right.click” es una galería virtual dedicada a la nueva fotografía contemporánea. Pretende ofrecer una plataforma tanto para artistas emergentes como para fotógrafos consagrados. Asimismo, a través de entrevistas y exhibiciones individuales de artistas selectos, “right.click” está dirigida tanto a profesionales del arte como a aficionados. El nombre de “right.click” alude por un lado al proceso fotográfico y por otro al contexto digital de la galería. Es decir, a la ubicación del disparador en una cámara réflex y al ‘clic’ que se hace con el ratón de ordenador. “right.click” is a virtual gallery dedicated to new contemporary photography. It offers an online showcase for both emerging and established artists. Through interviews and monthly solo exhibitions, “right.click” aims to reach a global audience and become a resource for art professionals and enthusiasts alike. The name of “right.click” alludes to the photographic process —to the location and release of the shutter button on a handheld camera— and to the gallery’s digital context —suggested by the right-clicking with a computer mouse. Licenciada en Bellas Artes por la School of Visual Arts de Nueva York. Patricia ha trabajado para las artistas Ellen Phelan y Nan Goldin, y como documentalista en el Museum of the Moving Image de Nueva York. Asimismo, ha sido asistente de investigación en el Departamento de Sociología de la Universidad de Harvard, donde también trabajó como fotógrafa principal del Humanities Center. Actualmente realiza su maestría en Bellas Artes en la Edinburgh College of Art (Universidad de Edimburgo). Patricia holds a Bachelor of Fine Arts from the School of Visual Arts in New York. She has worked for artists Ellen Phelan and Nan Goldin, and as digital archivist at the Museum of the Moving Image. She has been research assistant for the Department of Sociology at Harvard University, where she has also worked as main photographer for the Humanities Center. 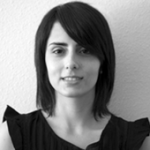 Currently she is working towards a Master of Fine Arts at the Edinburgh College of Art (University of Edinburgh).